Delhi saw us eating less adventurously than I would have liked – we were on a tight schedule, eating mostly at the numerous ceremonies and parties, and later not able to eat due to a stomach bug. 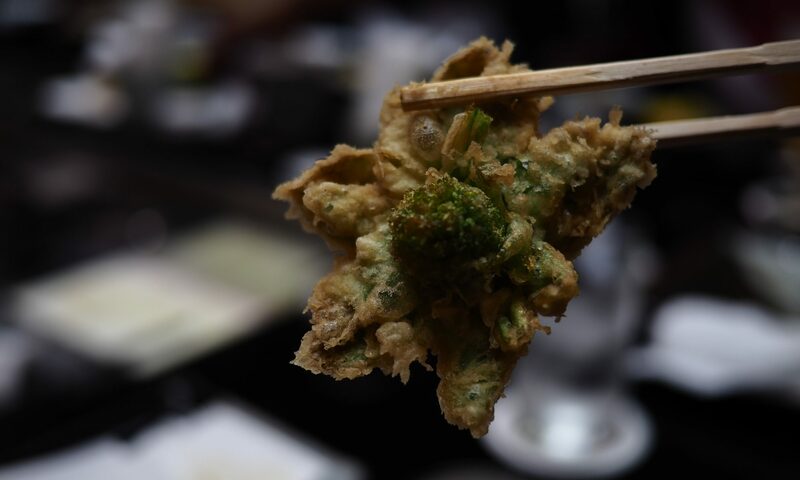 I still managed to get plenty of variety in, though, and can tell you about some of the highlights of the food. Some of the curry I ordered was startlingly good. 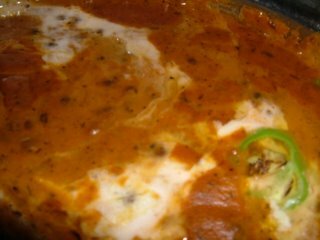 This is a Murg Tikka Patialewala – chicken marinated in yoghurt and spices, grilled and cooked in a pureed tomato and cashew sauce. The one-size-fits-all curry powder you see in the UK is a British empire invention, originally mixed for colonials to send home to cook with. No two curries in the same restaurant in India had the same base of spices (unlike those in some lazy Indian restaurants in the UK). This chicken was very heavy on the fenugreek and cumin, and had a lot of raw grated ginger stirred into it. 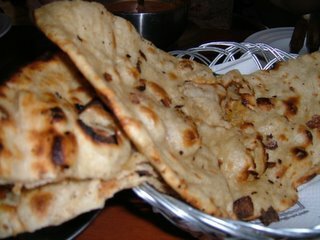 We ate breads with the curry – crisp parathas and open-textured naan, all made with rich and delicious ghee. Eating a curry with your hands takes a bit of getting used to (the right hand only – the left is reserved for . . . other purposes), but can be done quite neatly if you use a piece of bread as a little envelope to put your curry in. Papads (popadoms), grilled rather than fried, and flavoured with cracked black pepper, were served with every meal. On one of our two free afternoons, we took a trishaw ride around Chandi Chowk, one of Delhi’s oldest market areas. The driver was pedaling furiously, and it was extremely hard to stop in the constant stream of trishaw traffic, but we were able to look at, if not taste, a variety of street food (all going past at speed). People were crowding everywhere, many eating on the hoof. 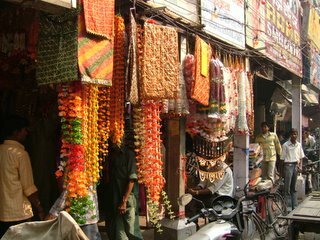 Stalls were ordered by type, so we pedaled through a stationery quarter, a car parts quarter, a sari quarter and a jewellery quarter. I asked the driver to take us to the food quarter. He put a spurt on and started to pedal enthusiastically through the crowd; no mean feat on a trishaw with two compulsive overeaters perched on the back. Asking to see the nutritional sites was a bit of a mistake on my part. Unfortunately, ‘food quarter’ when parsed through our driver turned out to mean ‘chicken market’. 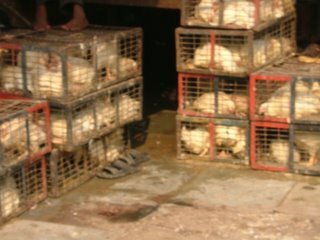 Hundreds of chickens, packed five to a wire crate, hunched in damp and stinking misery. Given rumours of bird flu, I spent about half a second ascertaining that none of the chickens were coughing, and, waving my arms furiously, asked the driver to continue. He did. Straight to an open-air, flyblown goat butchers. I gave up and went shopping for fabric. One of the most impressive things available on the streets was the fruit. 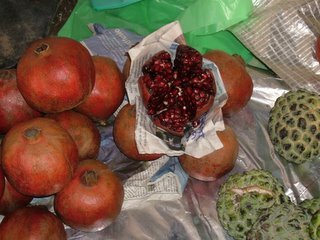 These pomegranates (are those custard apples with them? Let me know if you’ve any idea) were the reddest, glossiest, juiciest ones I’ve ever seen. We were able to enjoy some pomegranate seeds later, sprinkled on a curry. Satsumas, still green but perfectly ripe, were for sale everywhere, and we ate some in our room. 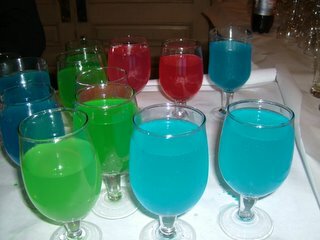 Lurid soft drinks punctuated all the wedding buffet meals. In the interests of science I tried all of these – the pink one tasted of roses, and the green and blue were identical in taste, flavoured with sweet, sweet spices, particularly cardamom. Other dishes at the buffets were tasty, but undistinguished (which is what happens, I suppose, when you’re catering huge amounts for more than two hundred people at once and trying to keep it all warm). Waiters popped up every twenty seconds with different silver platters of spicy canapes, and were not intimidated by my photographing all the food. The very best thing I ate was this gulab jamun – a tooth-achingly sweet dessert made from a condensed milk sponge dough wrapped around nuts and spices, particularly cardamom, soaked in sugar syrup, and sprinkled with more nuts. 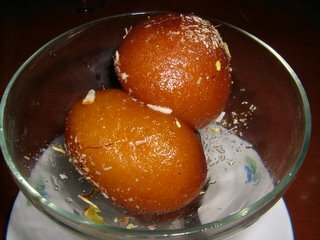 The sugar syrup was also spiced – you can see a strand of saffron on the ball of gulab jamun in the front of the bowl. 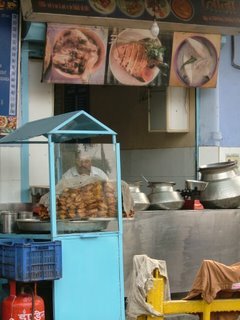 I wish we’d been in India for longer, and had some more time to sample some less formal foods. Normal service resumes tomorrow – my stomach seems to be behaving again. yea those are custard apples, known as sittaphal (sit-tah-fuhl).